your roof, find any damage or problem area and repair them in no time at all! Scottsdale, Arizona is a beautiful city to call home or to work at. It has a great climate, spectacular scenery and fantastic shopping venues. But even though Scottsdale experiences sunshine for the big part of the year, the wet and windy monsoon season requires your roof to be strong and weatherproof. To ensure that your Scottsdale tile roof remains strong and beautiful year after year, you need to work with an experienced roofing contractor who understands the demands of the local weather and climate. You need Arizona Native Roofing. Arizona Native Roofing has been providing top tile roofing services to homes and businesses in Scottsdale and surrounding areas for years. We have a great reputation with our customers and stellar ratings on Yelp, Google + and other consumer rated sites. If you are looking for a tile roofer that offers not only great rates, but quality workmanship, contact us today to learn more. Tile roofs are a fantastic choice for residential and commercial roofing structures in Scottsdale, because they look great and are extremely durable. Additionally, tile roofing is insulating, which means, that your home won’t get as hot during the summer and you will have to use your air conditioning less. A properly installed and maintained tile roof will save you tons of money down the road, because of its energy friendly properties. Plus tile is fireproof and last you easily for a lifetime or more, if, maintained regularly and by a local Scottsdale tile roofing professional. Even the best tile roof, will experience problems sooner or later. If you are dealing with a leak in your roof, it is important to get it looked at as soon as possible. Every small leak will eventually turn big and the bigger the leak, the costlier the repair. 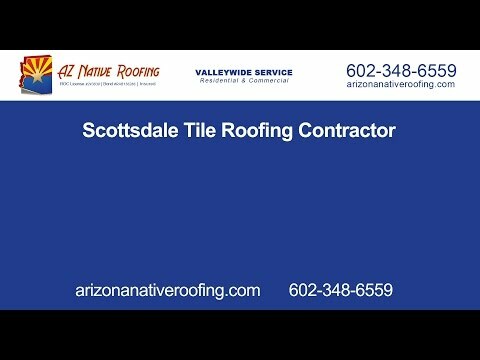 Our team of Scottsdale tile roofing professionals can assess the health of your roof, find any damage or problem area and repair them in no time at all. We can fix your tile roof and even find matching tiles for your existing roof to make sure that your roof will have a cohesive look. Ask us to learn more about our repair services. If you are in the market for a new tile roof or are planning on upgrading your shingle roof to a tile roof, we can help as well. Our roofing crew can check out the structure of your roof and determine if it is strong enough to carry the additional weight of tile, or if it needs to be reinforced. We offer affordable Scottsdale tile roof installations for commercial or residential roofs. Get the best roof yet- get an Arizona Native Roof. What are you waiting for? See the difference a tile roof can make for the appearance of your home, and its value as well. Don’t wait. If you are in need of tile roof repair, installation or other Scottsdale roofing services, contact us today. We offer comprehensive residential and commercial roofing services ranging from roof inspections, to roof repair, emergency repair services, new installs and reroofing. If you want a roof that lasts, call us today at 602-348-6559 for a free quote or more information.